When it comes to window shades, one of the most popular shades is white. Why? Because white is timeless, goes with most any style and décor, and also doesn’t go out of style. White shades are kind of like white trim in a home — you’ll see them more often than you’ll see trim of other colours. However, something else that white window shades can be is a little bland, especially if your style is more colourful! 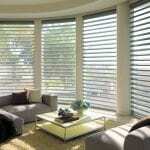 Here at Ashtons Blinds, we want to help you banish the bland from your home with some customized window shades. There are all kinds and types of window shades that you can add to most any room in order to get the look that you need. With types of shades like cellular shades, honeycomb shades, roman shades, blackout shades, fixed shades and panel track shades made in so many different types of materials and colours, with a little imagination, you won’t have to stick with the average white in any of your rooms ever again! Even if you don’t like white, you might be worried about staying fairly neutral with your window shades. This is especially helpful for people who might want to move somewhere down the line and need to get something that will work for the resale value of their home. Neutral colours, like tans, beiges, gray and even some greens and blues, can be great choices to add style, definition and personality while not being too overwhelming for the space. If you would like to see how our window shades and styles look in your home, we can come do a free in-home consultation for you. Give us a call today and let’s add some life and colour to your window shades!